A 55 year old patient was seen in our urgent care for nose bleed for 4 hours. The patient denies any trauma to the face. The patient is on blood thinner and had similar episodes in the past but lasted only 30 minutes and the patient was able to control it except this time it is lasting for more than 3 hours. The patient also takes metoprolol and Atorvastatin along with the blood thinner from Iceland. Dr. Jain saw the patient and ordered the lab work and started taking care of the nose bleed which was coming from the upper part of the nose (posterior bleed). The patient continued to bleed and did not respond to medicine for nose bleed. 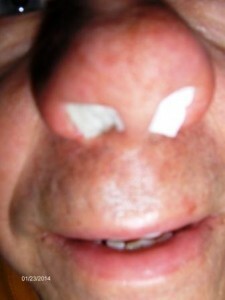 The patient nose was packed by Dr. Jain on both sides and was observed in the office for 2 hours. 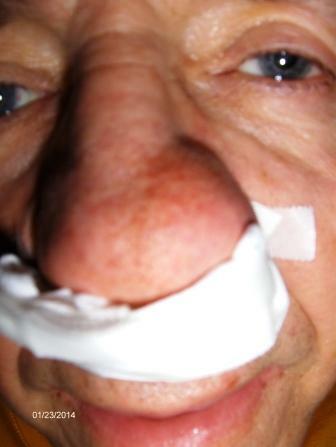 The patient did not have anymore bleeding from the nose and was sent home with the instruction to return next day to remove the nasal packing. Nosebleeds are not serious and can be handled fairly easily. The nose bleed can be anterior (front of the nose) two types, depending on whether the bleeding is coming from the anterior (front of the nose) or posterior (back of the nose). Anterior nosebleeds make up more than 90% of all nosebleeds. The bleeding usually comes from a blood vessel at the very front part of the nose. Anterior nosebleeds are usually easy to control either by chemical cautery or pressure. Posterior nosebleeds are much less common than anterior nosebleeds. They tend to occur more often in elderly people. The bleeding usually comes from an artery in the back part of the nose. These nosebleeds are more complicated and usually require admission to the hospital and management by an otolaryngologist (an ear, nose, and throat specialist). Nosebleeds are common during winter months and in dry, cold climates. They can occur at any age but are most common in children aged 2 to 10 years and adults aged 50 to 80 years. 1. trauma to the nose triggers a nosebleed. Trauma to the outside of the nose, such as a blow to the face, or trauma inside the nose, such as nose picking or repeated irritation from a cold, can cause a nosebleed. 2. Inability of the blood to clot, may contribute to the bleeding. Inability of the blood to clot is most often due to blood-thinning drugs such as warfarin (Coumadin) or aspirin. 3. Liver disease can also interfere with blood clotting. 4. Abnormal blood vessels or cancers in the nose are rare causes of nosebleeds. 5. High blood pressure may contribute to bleeding. This entry was posted in Emergencies, Emergency Care, Family Health Care, Medical Needs, Patient Stories, Routine Medical Services and tagged 32836, Blood thinner, Nose Bleed, Orlando 32835, Urgent Care. Bookmark the permalink.